Days and hours are passing like a jet nowadays. That too in the morning time, 'an hour' looks like 'a second' for me. Somehow I am fully occupied during that time to prepare breakfast, lunch, packing and other stuffs, which makes me to feel of having an extra hand. Tough my husband helps me, I still find myself completely occupied. Things apart, I prepared carrot rice today which made me to relax for sometime this morning. It helps me always when I run out of time in the morning, since I feel something from home is better than getting from office canteen. It is just a matter of eating home food. This Carrot rice was introduced to me by my Aunt when I stayed at their home during my college days. This was my 'most of the time lunch box food' and now I realise why my aunt prepared carrot rice frequently. Situations can be understood only on your own legs... Am I right? 1) In a frying pan, heat oil. 2) When it is hot, add mustard seeds and urid dal. 3) When they splutter, add curry leaves, green chillies and ginger garlic paste. Fry for a minute. 4) Add peanuts and give quick fry. Remember we added the roasted peanuts and so stirring is enough. 5) Add onions and saute them till they are translucent. 6) Add grated carrots and salt. Cook them without adding water till they become soft. 7) Reduce the flame and add cooked rice and mix gently. 8) Garnish it with chopped coriander leaves. 9) Serve hot with any side dish. 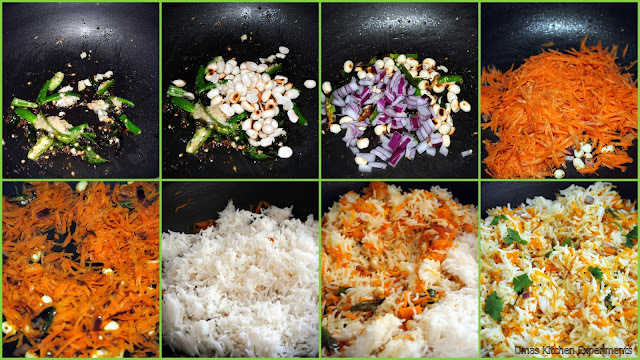 Nice clicks uma...Carrot rice sounds delicious. Simple and colourful rice! Clicks are nice. This my son's fav..colorful & tempting click.. Thanks for your lovely words on my blog..following you.. I am pleased by seeing your words. All credits go to my mom n mom-in-law. They are behind me for all recipes. Thanks Again.